If you are all turkey-ed out after the Thanksgiving Day feast, then today’s recipe is for you! I put together this Roasted Cranberry Balsamic Chicken Recipe as a tasty and festive alternative to turkey for holiday dinners. Turkey, mashed potatoes and gravy, green bean casserole and pumpkin pie. When you hear that, you think of Thanksgiving. It’s just traditional, that’s what you have for Thanksgiving. Sure, you swap out a few other family favorites, or maybe your family has that one special dish that you just HAVE to have every year (anyone for some red, white and blue Jell-O salad? ), but for the most part, everyone has the same thing on Thanksgiving. The trouble with this is really that I’m not a big fan of turkey. But at least I’m in good company, my family doesn’t really care for turkey either. But we serve it every year because…well…tradition. However, this year, I thought I’d try something new and different. Instead of the traditional turkey that’s been smothered in gravy, I thought I’d try chicken that’s been doused in cranberries. Cranberries are usually on sale this time of year and you get beautiful plump berries at a great price. They’re perfect to make a homemade cranberry chutney, or this Cranberry Balsamic Chicken. Cranberries are high in antioxidants and are heart healthy in addition to adding a tangy sweetness to this fabulous chicken. However, if you can’t find fresh cranberries, you can used thawed cranberries just as easily. It does take a little forethought (hello, meal planning!) because it should be marinated for at least 1-2 hours before roasting the chicken. However, if you know you’re going to have it, it’s easy to whisk together the marinade and chicken and refrigerate it overnight. The nice thing about roasting the chicken with the marinade (including the cranberries) is that you don’t have to worry about chopping the cranberries. Throughout the roasting process, the cranberries will burst and add their distinctive sweet-tart flavor to the chicken. 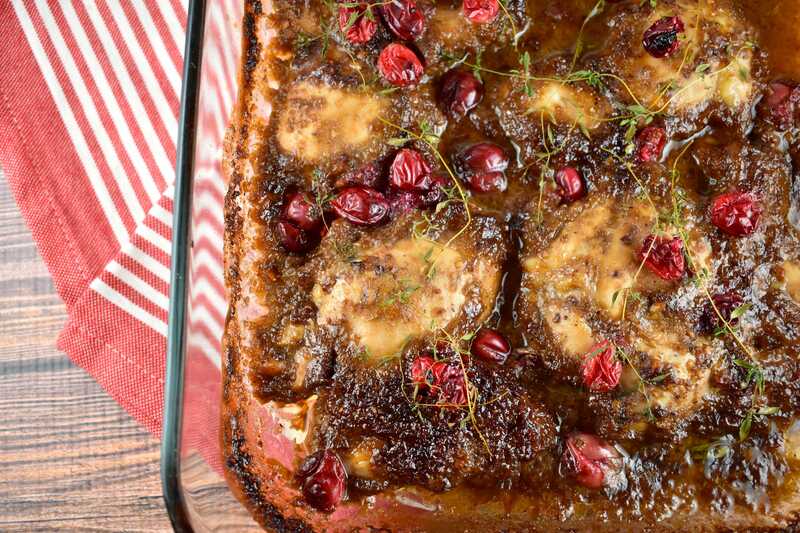 This is one of those great dishes that you don’t have to worry about plating it, just put the whole casserole dish on the table because it looks great with the chicken, dark balsamic sauce and bright cranberries. You can switch out the chicken thighs for boneless, skinless chicken breast for fewer points, but I wouldn’t recommend it. The thighs have more dark meat and have a richer flavor that works well with the balsamic and cranberries. I think that juicy and rich flavor is definitely worth an extra couple of points. Give this chicken a try this holiday season. You can test it out, like I did, and serve it right next to the traditional turkey and gravy. I bet there won’t be any left when you get done with the meal. It has the juicy chicken in addition to the sweet, salty and a little tangy. It’s the perfect combination of the holiday flavors that you love. In fact, I bet it won’t just be your new holiday favorite, you’ll probably want to have this throughout the entire year. CHECK OUT THESE OTHER LOW CALORIE HOLIDAY RECIPES! A delicious holiday chicken recipe that is both sweet and savory, and all cooked in one pan. It’s simple to put together, but delivers tender and juicy chicken that looks like you've worked way too hard on it. Place chicken in a large roasting pan or baking dish. In a small bowl, whisk together olive oil, soy sauce, maple syrup, balsamic vinegar, garlic, salt, pepper, and 1/4 cup of the cranberries. Pour over chicken. Cover and place in refrigerator to marinate for 1-2 hours, or overnight. Preheat oven to 375 degrees. Add remaining cranberries to the dish. Spread around evenly. Top with fresh thyme sprigs. Roast in the oven for about 25-28 minutes, or until chicken is cooked through, basting with the pan juices every 5-8 minutes. Then turn oven up to broil. Broil for another 2-4 minutes. Top with extra fresh thyme before serving. I love your recipes! Thank you so much for posting this. Trying it tomorrow and if it works out I’ll make it for my family get together for Christmas. I would love it if you posted more than just one picture of your final dish. And as for the folks not knowing how to print. Select the text, right click copy and paste into Word or a similar program even a blank email would work and then print. I just made this recipe and it was delicious. The only problem was that I had to guess on the amount of olive oil to use. The olive oil is not listed until the instructions. If you can copy the text and then paste in WORD, that may help you out. Olive oil is mentioned in the directions but is not included in the list of ingredients. How much? How do you print this recipe only? We haven’t actually eaten this yet, I just have it marinating now. But in the directions you say “wisk together olive oil, soy sauce….” etc. but there is no olive oil listed in the ingredients. I guessed at 1/4 cup, same as the balsamic, but if that’s way off, the points will be different. Also, you list fresh cranberries….but uncooked, fresh whole cranberries can’t really add any flavor to the marinade, so I roughly chopped them up. We’ll see how this turns out…. Okay, another question….the instructions don’t say if you drain the marinade before cooking, seems like you’d want to keep those cranberries in the baking dish. Why are your recipes not set up for printing just the recipe? It’s 1 tbsp of olive oil. I corrected the recipe…thanks for catching that! I didn’t even realize there was olive oil in the recipe and didn’t use it and it was just fine.